FATS AND O I LS SI .. Fat or oil Jan. :: Feb. Jan. : Feb.
1/ Converted tr U.S. cents -r -ourr. a.t current monthly rates of exchan-ge. imports of raw materials for manufacture were reduced considerably. butter, soybean, corn, and peanut oils. production of soybean, corn., and peanut oils. large cotton crop in 1937 and the increase in hog production in 1938.
pearance of fats and oils other than drying oils was larger. 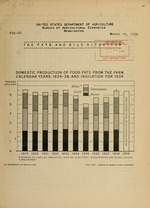 fats and oils in 1938 and averaged about 6 percent in the 5-years 1929-33.
in the United States in 1938 is estimated to be nearly 6.5 billion pounds. sane as thrt of last year. tonseed oil imports and will reflect chiefly the increased production of lard. demand for such oils in this country resulting from increased building activity. our former important foreign markets, such as Germany, appears probable. relatively large production, such as 1929, 1932, and 1933.
larger than in 1929 and perhaps the largest on record. of the pound sterling and some other foreign currencies. r-4 CV CMi r- UO w W.
net trade in fats and oils, and stocks. Figures are rounded to millions without adjustment to totals. kil. Mi". Vi:. I.i. -" Vii. M l. Mn. :ran. fS r 1 1 1 1. 4 *"- A- ** . .=:- "- : -_ .. ..
" ? T-i-i r- "' ear =e-e: --e :- T" ar e3gi.-.i-- A ril. 5 P- I -am= :? r ---. I--_ ia, Ss S7 ? s ai. Ite rs-e ~ ee r:-.. ie :: illi::s it -..'u: ri. :stZ -.t t: t-tals. :Mil. Mil. Mil. Mil. Mil. Mil. Mil. Mil. lb. lb. Il. lb. lb. lb. lb. lb. :Pet. pt. P Pt. Pt. Pct. Pet. Pet. 2/ Less than 500,000 pounds. 3 Includes 740,601 pounds from Gold Coast. 5] Includes 779,485 pounds from Portuguese Africa. f/ Includes Portuguese West Africa and British East Africa (Tanganyika). Sil.Mi. Mi Mil. Mil. Mil. Mil. Mil. PALM-KERKEL OIL AIFD : lb. lb lb l lb. lb. lb. 3/ Less than 500,000 pounds. Not reported prior to 1936. Not reported prior to 1933. Compiled from Foreign Commerce and Uavigation of the United States. Compiled from Foroign Commerce and Navig-tion of the United States. Item : Dec. Jan. Dec. : Jan.